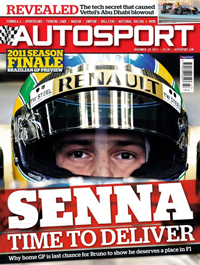 In this week's AUTOSPORT magazine, find out what Bruno Senna makes of his half-season with the Renault F1 team and how he rates his chances of retaining his drive for 2012. On the eve of his home race at Interlagos, Renault Formula 1 racer Bruno Senna gives a frank assessment of his status to Edd Straw. The Brazilian admits that having that surname has been both a help and a hindrance as he tries to cut a creditable path through the upper echelons of racing. Long-time Brazilian AUTOSPORT correspondent Lito Cavalcanti recalls the day, only as recently as 2004, that Senna first sampled a single-seater, painting a fascinating picture of his progress in that time. Lastly, we analyse each of Senna's races this year, starting with his replacing of Nick Heidfeld at the Belgian Grand Prix at Spa in August, and ask whether he's justified the faith shown in him. Mark Hughes column – Our grand prix editor assess the situation with Robert Kubica and his relationship with the Renault team. Will he still return to the sport, or are we facing a cruel 'the-one-that-got-away' scenario? Brazilian GP preview – Expert analysis from David Coulthard, Gary Anderson and Lucas di Grassi ahead of the final grand prix of 2011 in Brazil. Full track map, driver opinions and TV/radio times are included. Romain Grosjean – The Frenchman tells Glenn Freeman that by winning the GP2 title for DAMS, he's done everything he can to make the leap back to F1 in 2012. DAMS: GP2 champion team – Glenn Freeman talks to the key players of the veteran squad as he explains how it managed to finally lift the GP2 crown. My season: Jerome d'Ambrosio – The Virgin F1 racer talks about his maiden season at the top level and assesses his chances of staying put in 2012. Tom Kimber-Smith – Disillusioned by a lack of results, Tom Kimber-Smith gave up racing to pursue other interests. Bitten by the bug again, the former British Formula Ford champion made an instant impression in sportscar racing this year. He tells Gary Watkins that he's back for good. Macau Grand Prix – The blue riband, end-of-term Macau F3 race was another classic, and through it all came Spaniard Daniel Juncadella and Prema Powerteam to win. Charles Bradley was trackside. WTCC Macau – Rob Huff did all he could to wrestle the title from Yvan Muller with two wins, but the wily Frenchman did enough behind to make sure of a third title in four years. Charles Bradley watched all the Chevrolet-dominated antics. Richard Burns: the untold Subaru story – To mark the 10th anniversary of Richard Burns' World Rally Championship success, David Evans reveals the train of events that led the Englishman to sign for Subaru for 2004 after two frustrating years with Peugeot. Sadly, his illness, to which he succumbed in 2005, meant it was not meant to be. From the archive – Desire Wilson becomes the only woman to win an F1 race thanks to victory in the second round of the 1980 Aurora AFX series at Brands Hatch in her Theodore Racing-run Wolf WR3-Cosworth. Race of my life – Sportscar superstar Andy Wallace tells Henry Hope-Frost that his second Grand-Am victory at Homstead in 2004 aboard the Howard Boss Crawford-Pontiac was the race of his life. Raikkonen's return: Great comeback or uncomfortable epilogue?